Energy companies will be charged 20 per cent more for the right to develop Alberta's oil and gas resources, Premier Ed Stelmach said Thursday, a move immediately slammed by the industry. Energy companies will be charged 20 per cent more for the right to develop Alberta's oil and gas resources, Premier Ed Stelmach revealed Thursday, a move immediately slammed by the industry. Introducing what he called "a framework for a new century," Stelmach said oil and gas companies will be paying $1.4 billion more a yearin royalties starting in 2009. That figure is 25 per cent less than the $2 billion recommended by a government-appointed panel that reviewed the royalty formula, which has not changed since 1992. Stelmach rejected about half of the panel's recommendations, including a new tax on oilsands production. However, royalties will increase for conventional oil, natural gas and oilsands projects, with Stelmach promising a simpler framework that reflects fluctuations in market prices. "We recognize energy is a volatile industry. There is risk and there is reward. 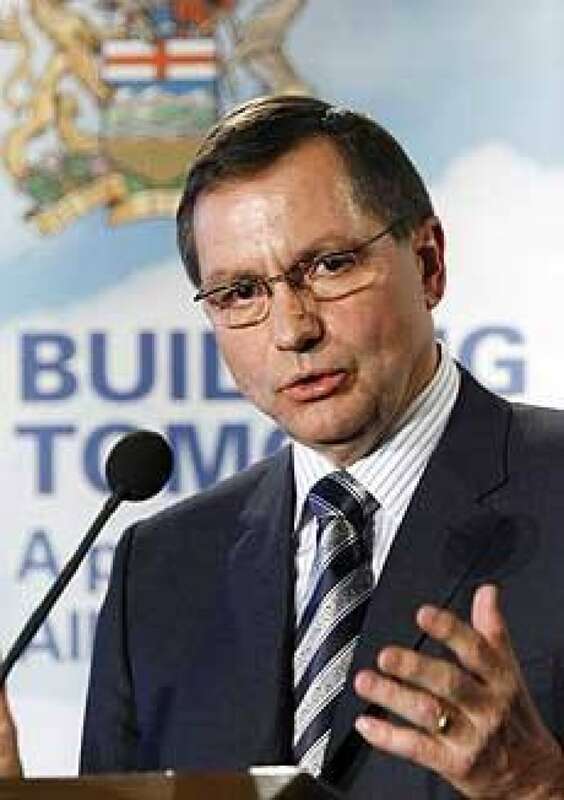 So when oil prices go up, the royalty goes up," Stelmach said in a news conference in Calgary. The panel's report, released five weeks ago, concluded Albertans were not receiving their fair share of the province's non-renewable resources and called for an increase of $2 billion in royalties. The report rocked the energy industry, which launched an aggressive campaign against any royalty changes. Oil and gas companies warned an increase will force them to slash jobs and billions in investment in booming Alberta. Stelmach said existing oilsands projects will not be grandfathered. The province will negotiate a transition to the new rates with companies, including Syncrude and Suncor, who have agreements that expire in 2016. "We need a bigger pie. We can't just carve up the existing one," Stelmach told reporters. "We are confident we made the right decision for today and for Albertans' future." Despite Stelmach's rejection of some of the panel's recommendations, thepresident of the Canadian Association of Petroleum Producers expressed shock and disappointment over the higher royalties announced by the premier. Pierre Alvarez said it appears the province didn't take into account the soaring costs the industry is facing when it decided to increase royalties. Hecalled the move "a very, very serious day in town and there is a lot of concern about how this announcement's going to unfold as we go forward." But the energy industry leader expressed some relief that the royalty changes won't take effect for 14 months. Agroup that represents small energy producers is also expressing disappointment over the government's decision to hike royalties by roughly $1.4 billion starting in 2009. Gary Leach, executive-director of the Small Explorers and Producers Association of Canada, said the changes will hurt production and investment in the energy sector. Political observers believe the royalty decision is a defining issue for the premier, who has had the top job for just 10 months and is rumoured to be gearing up for a fall election. YOUR VIEW: What do you think about the Alberta government's decision?